You may not have noticed this so I think it would be best to make sure we all know - Christmas is coming. Just a few weeks are left to buy our friends and families what they want for Christmas as well as dodgy sweaters, selection boxes and the normal Christmas line up of dodgy goods. This Christmas though, don't just think about your family when you're tucking into that yummy Christmas lunch or getting drunk whilst a disaster occurs on Eastenders - think about Formula 1 drivers. 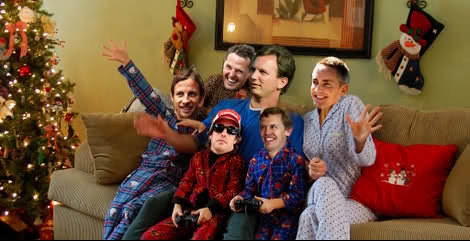 What will they be getting this Christmas? Will they sharing the misteltoe and wine? More importantly, have they been naughty or nice? What do they deserve as a perfect present? And not only that, what about those in the paddock? I thought this could be a good opportunity to get out my ideas for what I would give to most Formula 1 drivers and personnel based on what they definitely need through a long year of F1. 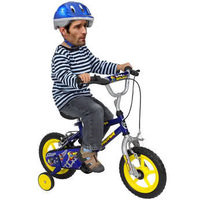 With the sudden news recently that Mark Webber recently fractured his shoulder following a bike accident late on in the 2010 starting to float out of the media, it's surely a perfect present for this determined Aussie to get some bike stabilisers following his second bike fall in 2 years. Poor guy! But he is surely on Santa's nice list because he's had a great year in f1 and seems to get on with everyone, unless you work for Red Bull of course. Bike stabilisers may be what get him a championship in the future though so it's a better present for him than you may think! Well it's not exactly unpredictable this one! After all, it is the supposed moment of the year according to AUTOSPORT so it's only right we treasure the moment with a lovely Fireman Sam suit for Heikki to enjoy over the festive season. Look! It'll even come with a lovely little axe for our favourite Finn to use when he tries to uncork Trulli's bottles of wine at the Lotus new Years party. Maybe Heikki would prefer a hug from his no. 1 fan Amy instead of Fireman Sam's suit? He should get both, especially after he so kindly signed and posed with Lou's Sidepodcast flag at the Goodwood Festival of Speed! Love this man! 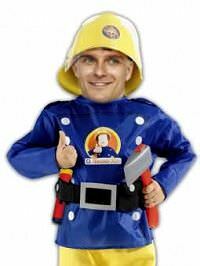 Of course Heikki's had a big year coming out of the Hamilton shadow so he's had a nice year whilst fighting off fire and even managing to cause destruction along the way. Go Heikki! 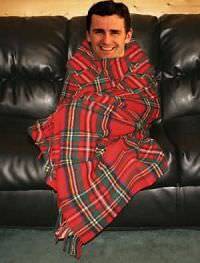 With all due respect to Hedgehog, his F1 career is pretty much into it's latter stages now or probably even beyond that so it might be nice to get Pedro a nice warm tartan blanket for him to wrap around him on the cold nights and get him a nice cup of tea for him to enjoy, maybe even throw in a membership to the local bingo place whilst we're there. I do like Mr De la Rosa but I think his career has sadly moved on now, with only about half of the season before he was replaced by the grizzly Nick Heidfeld. When Pirelli don't need their cars washed and tyres tested then I'm sure Pedro would make good use of this as he settles down to watch Emmerdale and talked to his neighbour Betty about how back in his day front wings didn't flex. 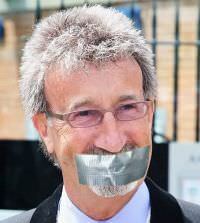 Eddie Jordan has most definitely made Santa's naughty list in 2010, continually annoying viewers worldwide and asking questions that go on longer than Toro Rosso confirming their drivers. Yes, Eddie, we know you created Jordan. In fact, if you hadn't reminded us for the 7th time this broadcast then we would never have noticed the link between your name and the team's name! So it's only fair that my present to Eddie would be a big roll of duct tape to put over his mouth and keep him quiet. This would be proper industrial duct tape though because that's the kind of thing you need to keep a man of this audacity quiet! Seeing as they mean so much to Michael it's only fair that the one thing he should get this Christmas are some odd numbers. Maybe there are a numbers version of those potato alphabet things you can buy from supermarkets but with odd numbers, like 71, 95 and of course 33. It is after all a lack of odd numbers in Michael's life that contributed to his downfall in 2010, and now that 2011 has even more odd numbers in the year he can have more odd numbers in his life just like he demands. Then he can take them back to the Death Star and and show Ralf what the number 1 is. So these are some of my ideas as to what F1 drivers should get this Christmas and what's put onto people's Christmas lists. There's only about 2 weeks shopping time left so if you need to buy your F1 driver something, make sure you share it in the comments and let us know your ideas as to what would be the perfect present this Christmas for those in the paddock!